Throughout the Holiday season and heading into a New Year, there is always talk about New Year’s resolutions. For some people those resolutions are pretty standard: lose weight, get in shape, and eat better. Sometimes resolutions are small things like making your bed every day or saying “thank you” more. Other times, resolutions can be monumental and life-changing like getting a new job, exiting a toxic relationship or moving somewhere new. At one of my family dinners over the Holidays the topic of New Year’s resolutions came up and my Mom told us about one of her friends that had chosen a word for 2018. Her word was “transformation” and that is what her goals centered around all year, including losing 30 pounds! This idea of choosing a word and working on it all year really intrigued me because it sounds and feels a lot like setting an intention for the New Year, much like how one might set an intention on your yoga mat before practicing. I’m sure everyone has different ways of setting their intentions before a yoga practice. Sometimes (most of the time – something I could be better at) I forget to set my intention at the beginning of my practice unless I’m prompted to. However, when I do set an intention, it’s normally a word or two that I bring to mind and mediate on. Most of the time (as I’ve talked about before) it centers on “gratitude” and being thankful for the ability to be moving. Coming back and revisiting this intention helps me stay focused on the positive things – so I might not be able to get up into Pincha Mayurasana yet, but I am able to try and have the opportunity to move my body and continue to practice. Going into 2019 it seems fitting to set an intention for the New Year – a word or phrase that will be something to meditate on and revisit throughout the year. Although this might sound easy (and might actually be for some people), it can be hard to take an honest look at your desires for the coming year and set an appropriate intention that will motivate, inspire and keep you accountable. 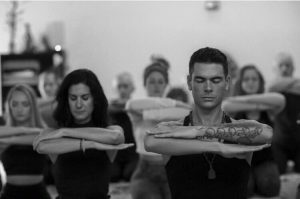 Whether or not you have a New Year’s resolution or plan to set an intention for 2019, I wish everyone in the Yoga Time Studio community a very happy and healthy New Year!